Five states—Indiana, Virginia, Nebraska, Texas, and Georgia—account for forty percent of the total amountof toxic discharges to U.S. waterways in 2010, according to a new report released today by Environment America.Wasting Our Waterways: Industrial Toxic Pollution and the Unfulfilled Promise of the Clean Water Act also reports that 226 million pounds oftoxic chemicals were discharged into 1,400 waterways across the country. The Environment America report documents and analyzes the dangerous levels of pollutants discharged to America’s waters by compiling toxic chemical releases reported to the U.S. EPA’s Toxics Release Inventory for 2010, the most recent data available. Food and beverage manufacturing (slaughterhouses, rendering plants, etc. ), primary metals manufacturing, chemical plants, and petroleum refineries were some of the largest polluters. AK Steel dumped the most toxic pollution—nearly 30 million pounds—into our waterways in 2010. In 2010, industries discharged approximately 1.5 million pounds of cancer-causing chemicals, like arsenic, chromium, and benzene, into America’s waterways. Nevada’s Burns Creek received the largest volume of carcinogens in 2010, while neighboring Mill Creek placed third. Nitrates accounted for nearly 90 percent of the total volume of discharges to waterways reported in 2010. Nitrates are toxic, particularly to infants consuming formula made with nitrate-laden drinking water, who may be susceptible to methemoglobinemia, or “blue baby” syndrome, a disease that reducesthe ability of blood to carry oxygen throughout the body. Environment America’sreport summarizes discharges of cancer-causing chemicals, chemicals that persist in the environment, and chemicals with the potential to cause reproductive problems ranging from birth defects to reduced fertility. Among the toxic chemicals discharged by facilities are arsenic, mercury, and benzene. Exposure to these chemicals is linked to cancer, developmental disorders, and reproductive disorders. Protect all waters: The Obama administration should finalize guidelines and conduct a rulemaking to clarify that the Clean Water Act applies to all of our waterways – including the 2.5 million miles of streams in and 117 million Americans’ drinking water for which jurisdiction under the Clean Water Act has been called into question as a result of two polluter-driven Supreme Court decisions in the last decade. “The bottom line is that America’s waterways shouldn’t be a polluter’s paradise, they should just be paradise. We need clean water now, and we are counting on the federal government to act to protect our health and our environment,” concluded Vinyard. This entry was posted in Uncategorized and tagged AK Steel, Coal, Indiana Gasification LLC, Indiana pollution, Mitch Daniels, Ohio RIver, Rockport Indiana, toxic pollution, water pollution. Bookmark the permalink. Sadly, it all comes down to money. When governments and the people, not the industries that control them, are willing to spend money to control, regulate, and tighten up the pollution standards, then we will begin to get clean water and air for the only lives we have and the lives of our children. While money is valued for itself, that won’t happen. So what exactly is AK Steel discharging in the water? It is largely nitrate compounds. grand kids to clean up. Wonder why environmentalists are never taking seriously. Why show images of cooling towers emitting water vapor? 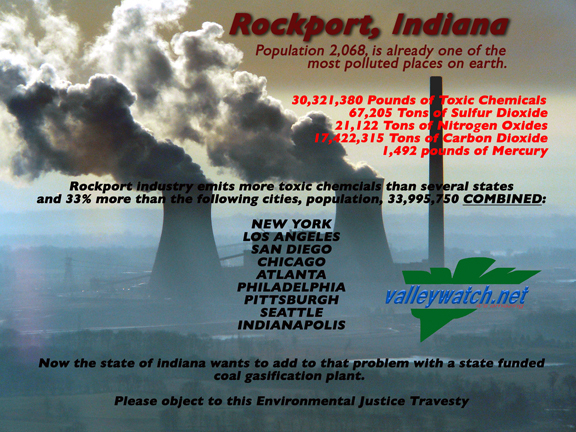 Those cooling towers are also polluters but that fact notwithstanding, the Rockport Power Plant has been and continues to be one of the largest industrial polluters in the entire midwest. And, the power is shipped out to southern Michigan and northeast Indiana while the residents of southwest Indiana and west Kentucky are forced to breathe the toxins and fine particles that emanate from the giant plant.